By anyone’s definition, 1970 was a momentous year for Buffalo sports. That year, the Sabres and the Braves were founded in the NHL and NBA, respectively, and the Bills joined the newly merged NFL. This month, history was made again as the puck dropped for the inaugural season of the National Women’s Hockey League (NWHL) — and our own Buffalo Beauts took the ice. For Mroz, who first laced up a pair of ice skates at 18 months old, the league is a long-overdue bid at greater prominence for her favorite sport. 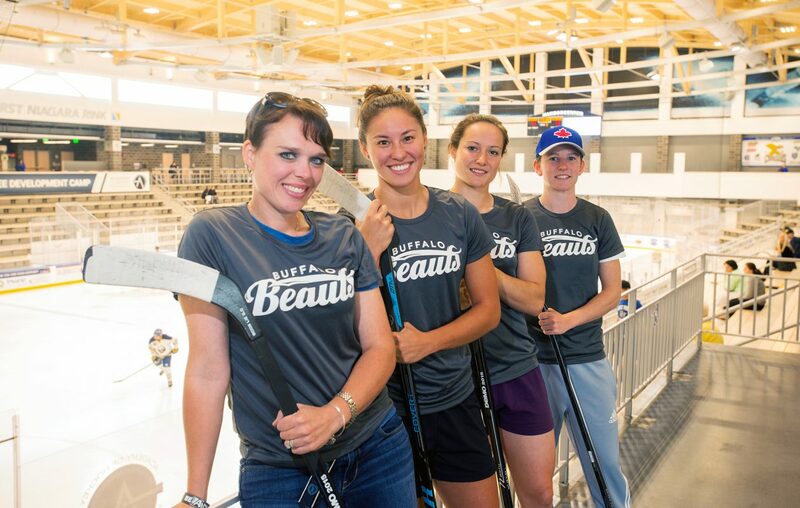 The National Women’s Hockey League announced its formation last spring with four founding teams: the Buffalo Beauts — who will play home games at HarborCenter — as well as the Boston Pride, New York Riveters and Connecticut Whale. The season began Oct. 11 and runs through playoffs in March when the teams will vie for the Isobel Cup, named for Lady Isobel Gathorne-Hardy, daughter of Lord Stanley. Dani Rylan, NWHL commissioner, said the inaugural four cities were selected because of their high concentration of hockey fans and their close proximity to one another. And so far, the Beauts have resonated with Buffalo’s diehard sports fans. Brianne McLaughlin, Beauts goalie and two-time Olympic silver medalist on the national women’s hockey team, was surprised by how quickly — and positively — fans have responded to the team. Women’s hockey debuted at the Olympic Games in 1998, and has grown steadily in popularity in each subsequent Olympics. Last year’s gold medal game between the U.S. and Canada ranked as the most-watched hockey game in the past four years, other than the Stanley Cup Finals. As the first paid professional women’s hockey league in the U.S., the NWHL is already in a class of its own — and attracting sponsors and players who back its mission of growing the sport and supporting young female players. Rylan said she knows the league will have to prove itself to survive long-term, but is confident the support will be there from fans, the hockey community and investors. For players like Beauts defenseman Lindsay Grigg, who graduated from Rochester Institute of Technology last May, the NWHL provides an opportunity to continue honing her skills and play as part of a team. “Hockey has always been my passion and a sport that I truly love, so to be able to play it at this level is just such an amazing feeling. There are not many words to really describe it,” Grigg said. Meanwhile, for young athletes, Mroz said the NWHL provides heroes for girls to look up to and learn from. The Beauts held preseason youth training camp for players ages 13-18 in August and hopes to expand the camp next year. McLaughlin coaches girls’ youth hockey in Pittsburgh and recalled the passionate response from her players when the league was announced — long before she even put on a Beauts jersey. As the season gets underway, Mroz said her goal is simple: to sell out every home game, and to field a competitive team. With early fanfare and top-tier talent like McLaughlin, Grigg and first-year draft picks Sarah Lefort and East Aurora native Emily Janiga, achieving that goal is within reach. For more info and a game schedule, go to NWHL.zone.